Las Vegas is so huge and a Cheapo wallet is so small, there couldn’t possibly be an affordable way to see everything. Right? Well, Casino Boy has the scoop on one of the easiest ways to see not just Las Vegas, but other destinations in Nevada as well. Turns out there is more to Vegas than loosing your shirt and getting turned down at the bars. “Best Las Vegas Tours,” (we love names that are easy to remember) is a family owned and operated business made up of a small group of international tour specialists. With cheaper rates than the competition and promotional prices, Best Las Vegas Tours is a good choice for Cheapos looking to do some serious sightseeing. Here are just a few of the things to do in Las Vegas with Best Las Vegas Tours. Book a SIGNATURE tour that features VIP Level service to the Grand Canyon and surrounding areas of Las Vegas, Nevada. Travel by airplane, helicopter or SUV to score some of the most breathtaking views in the country. See the Las Vegas Strip, Grand Canyon or Monument Valley like you’ve never seen them before. A SIGNATURE tour eliminates all the hassles of traveling. Each of the SIGNATURE tours include different perks such as free airfare, food, deluxe accommodations, champagne, and hotel transportation. Las Vegas first-timers and veterans alike will find the perfect option at Best Las Vegas Tours. Besides the SIGNATURE tours, there are also Cheapo budget friendly options such as Air, Bus and helicopter tours. The friendly tour guides know their stuff and ensure you get the most out of the experience. Breathtaking views of the Hoover Dam and the South and West Rim await, don’t forget a camera. Also, many of the tours include guaranteed entry to Sky Walk, which is basically a fancy platform extending over the edge of a cliff at the Grand Canyon with see through glass below your feet. If you’re a thrill seeker, Sky Walk is a must-see in Nevada. If you're looking for a way to unwind after a long day of touring and exploring, check out our Party Tours Las Vegas page as well for some great cheap options! Most people book a tour because they want to have an unforgettable adventure. Best Las Vegas Tours hosts some of the most fun Adventure and Specialty Tours around. Go whitewater Rafting in the grand canyon, raft through Colorado river, or zip line through Bootleg Canyon. Check out the mysteries of Area 51 or zip through the desert on an ATV. True adrenaline junkies can take part in a top rated tandem skydive with a professional instructor. Be sure to get the video so your future kids believe you when you say, "I used to be fun!" 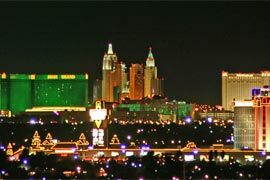 Ultimately, Best Las Vegas Tours does all the work and you and your group can have all the fun. Ditch the booze and loose routine and book a Las Vegas vacation you'll actually remember! Have you ever taken a tour in Las Vegas? Are you brave enough to jump out of a plane? Tell us about your Las Vegas vacation! You can use the comments section below, and don't forget to check CheapoVegas.com for the latest promo codes and event listings.